Since I picked up so much kitchen cotton this year, it was time for me to start using some of it! 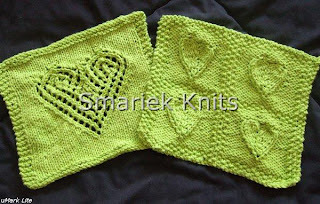 So I made some heart themed washcloths to make a "set" for gifting. 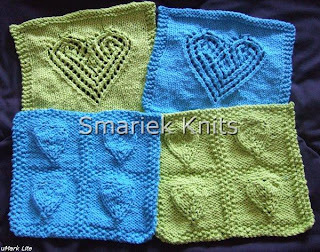 They're all knit with Lily Sugar & Cream, in the "hot" colors. The hot green color is quite bright. 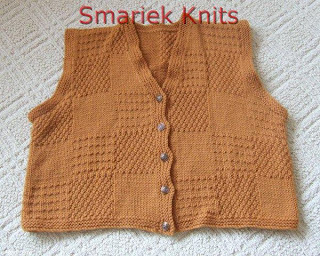 This cloth is a quick knit that can be done in a little over an hour. A little while back I added an alternative method for doing the D4 decrease, since some people were having difficulties with it. Give this one a try, you may find it easier to execute. 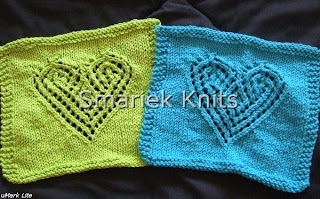 Something I probably never mentioned before is that I was originally going to call this cloth "Windowpane Hearts". I've never been very good at naming things. 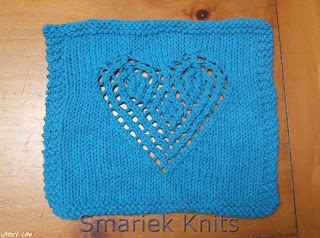 People would probably like this cloth more if I had stuck with the more catchy "Windowpane Hearts" name instead of calling the pattern what it really is, which is "4 Embossed Hearts". 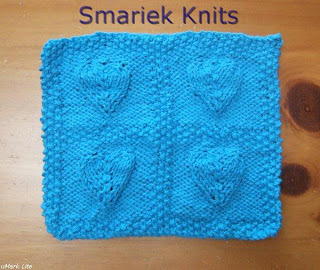 To help make the hearts "pop" more, when you block the cloth, push up the hearts from the back side and press down on the purl background around the hearts. Is blue and green an odd color combination? I wasn't sure how to pair up the hot green color. Did I mention that this is a really bright green color? I think you'd notice it more when you have the yarn in front of you. 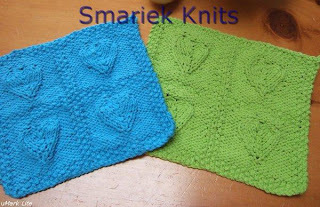 Speaking of dishcloths, check out these cute Pacman cloths. Whether you usually read off of your own book pile or from the library shelves NOW, chances are you started off with trips to the library. (There's no way my parents could otherwise have kept up with my book habit when I was 10.) So … What is your earliest memory of a library? Who took you? Do you have you any funny/odd memories of the library? My first library was the Noe Valley branch on Jersey Street in San Francisco. I remember walking up the (many) stairs to the main (second) floor and then forward through to the children's section. I spent much of my time there as a kid. I can't recall if there was an elevator in the building (I don't think accessibility was a big thing back then), however I do know that the building has been closed for renovation recently and will probably have an elevator if there wasn't one before. My mom would take me to the library. Other times I would just walk the few blocks over to the library on my own. Yes, this was back in those days when it was safer for kids to walk about on their own. I used to walk to school too. I don't think parents would do that today because times have changed. I vaguely recall a library van that went around the neighborhood with books you can check out. Unfortunatly I have no further details. My memory of this is quite hazy. I remember library cards being green. Then there was a long period when I stopped going to the library. I guess I tended to buy more books during this period. Later on, I applied for a new library card and was surprised to find them white colored with a barcode/magnetic strip on the back. This was apparently in May 2006 cuz I happened to blog about it. I've checked out mostly children's books (for Miss M) since then. 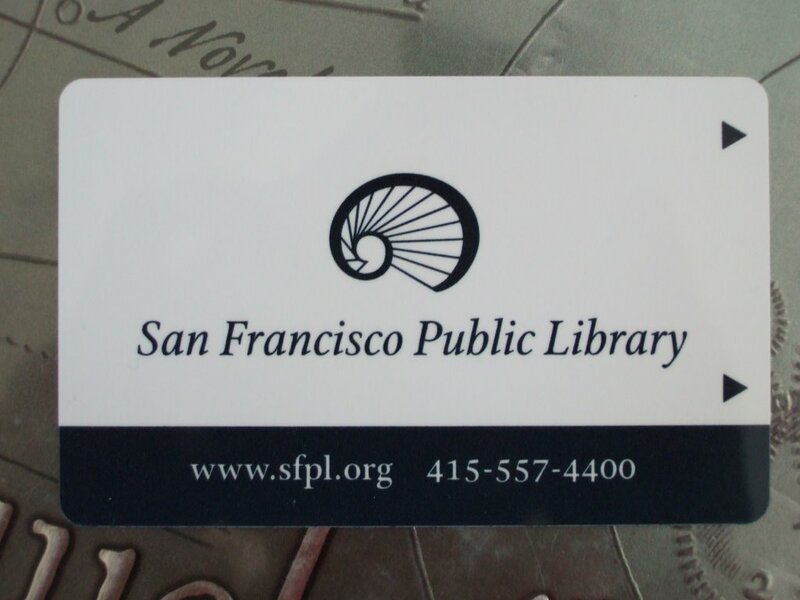 And then stopped using my San Francisco library card when we moved in September 2007. I remember being surprised at all the changes to the library system. Everything is computerized now. There are no longer small colorful due date papers slipped into pockets on the front cover of books. Or due dates stamped on a piece of paper that is on the book. The best part of these new changes is that we can do catalog searches online and renew books online. 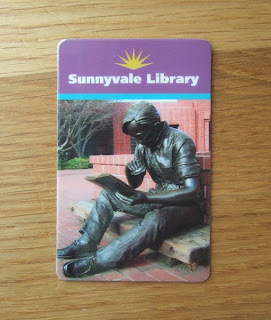 The statue pictured on the library card is outside my current library. 1. Dancing to the music while people are watching makes me feel self-conscious. 2. The last time I went to Target (after dropping off Miss M at day care) I spent nearly three hours there! 3. When I drive I feel like I'm being tossed around like a ragdoll by all the other crazy drivers around me. 4. I saw my toddler standing on a stepstool, figuring out she could open the pantry door by doing this. 6. Next week I am NOT looking forward to my doctor's appt. 7. 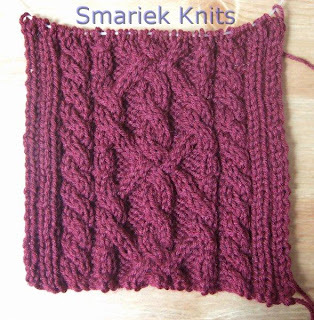 And as for the weekend, tonight I’m looking forward to finishing Elann HUGe swap item #8, tomorrow my plans include taking care of Miss M who has a 104+ fever and Sunday, I want to veg! Miss M woke up early this morning and hasn't been feeling well since. She took a 1.5 hour nap in the morning after breakfast and when we took her temperature it was 104+ ºF! (That's 40+ ºC) I'm surprised that she is up and about in relatively good spirits for someone which such a high temperature. I remember having a 104ºF fever decades ago and I spent that time in bed feeling miserable. 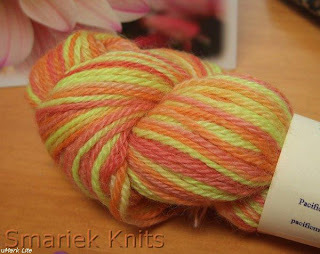 I finished item #8 for the Elann HUGe 2008 swap. I haven't gotten around to taking photos of it yet. Now I have 2 more to complete and then mail all 10 to Theresa by October something. I haven't decided whether I will wrap each of them. I'm inclined to leave them "open" so Theresa can see what colors they are. I have the feeling she has a good idea of who would like which color when she is putting together the swap boxes. 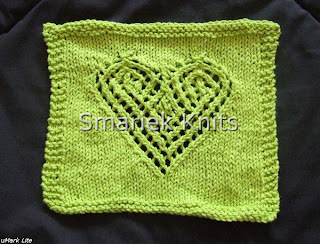 Besides the heart dishcloths I made above, I did finish another one last week. It's a lacy dishcloth. I'll share photos of that one another day. 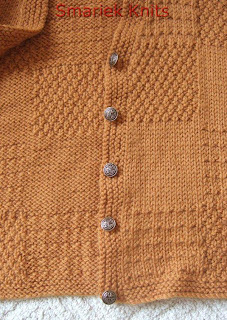 I've been meaning to frog my February Lady Sweater because I need to start over using smaller needles and make larger button holes for the buttons I got for the sweater. 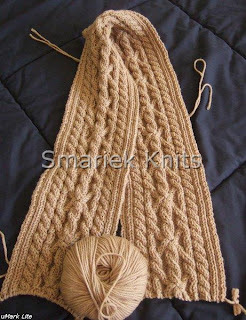 I just hadn't gotten around to doing this yet and now I'm afraid the yarn will be too "curly". 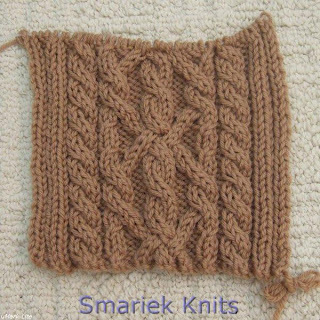 Trish is using the same yarn, Elann Superwash Bamboo, for her February Lady Sweater and she has posted some interesting findings from swatching with this yarn. I've been too busy lately to keep up with blog reading and notice that my blog reader says I have 1000+ posts to catch up on. Right now it feels like an overwhelming task to try to catch up. Would it be terribly wrong to mark them all as "read" and start over with a clean slate? Will the Blog Reading Police come after me if I do this? 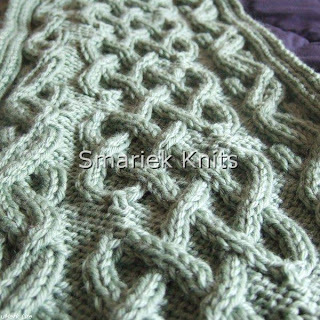 And when I'm knitting in bed, I'm chipping away at "The Two Towers", book #2 in The Lord of the Rings series. This is an audio book. 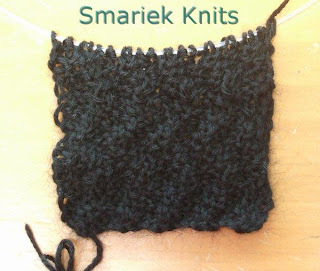 I love audio books as they allow me to knit at the same time. I've been trying to work on a blog post for many days now. Unfortunately I haven't been able to sit down and focus on this one thing. I've never been good at doing something when I feel "interrupt driven". Georgi tagged me for this meme a while back. I started typing this up and then it got buried in draft mode. I've only just rediscovered it! Rules are posted at the beginning. At the end of the post, the player tags 6 people and posts their names. Then the player goes to each of the “named” people’s blogs and leaves a comment, letting them know they’ve been tagged and asking them to read your blog. If you’ve been tagged, you do the same, letting the person who tagged you know when you’ve posted your answer. Your answer, of course, is the answer to the following questions. Here we go! Let's see, 10 years ago was 1998. Where was I then? That was the year I visited Nashua, New Hampshire and Washington, D.C. for the first time. And outside the USA, I went to Vancouver and Victoria in Canada around Christmastime. Back then I was working for an investment banking firm in downtown San Francisco. 2. 5 things on my to-do list today? -- Write to Carolyn in Maine. I've been trying to do this for months and months and months. -- Get photos off my camera because the card is full!!! Depends on whether I'm in a sweet or salty mood. Lately my snacks have tended towards Kettle Chips in their lightly salted flavor, blue cheese, and chocolate. Not all together in one sitting. -- Pay off the mortgage. Then realize that we can buy a bigger place in a neighborhood with a better school district, lol. -- Donate anonymously to help others. -- Sign up for classes. The list includes: French language, Latin language, cooking classes, knitting classes, photography classes (and a Photoshop class). I've made some progress on my Triumph Cable Scarf. 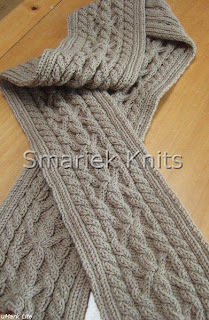 I haven't had a chance to measure the length, however I think the finished length will be fine using the 5 balls of Elann Luxury Merino Superwash I have. 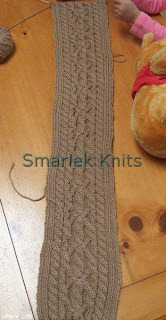 It's Cafe Au Lait color which I've grown to like even more while knitting this scarf. It is too bad this color is out of stock at the moment. I had to share this photo of Miss M stabbing my scarf with one pointy end of my knitting needle. She's always trying to "help" when I take photos, usually by pulling or patting on the knitting. Other times she isn't touching the knitting but happens to sit between the knitting and my light source, causing a shadow over part of my knitting. 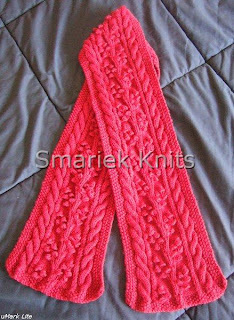 -- I'm still working on my MIL's Regina Scarf. 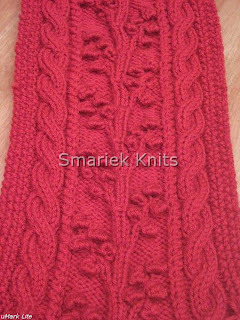 I started this back in January and although it does not need to be done until Christmas, it really should not take this long to finish a scarf!!! I do chip away at it when I'm not working on the Triumph Scarf. I'd say I'm about 3/4 done with the scarf. I don't think it will be completed by August 24th though. 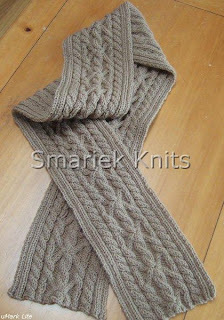 I should just concentrate on finishing the Triumph Scarf first. -- The Elann HUGe swap. I'm averaging 2 items per month and am currently working on #8 (out of 10). I need to find out when the deadline is and where to send everything. I know I've emailed Theresa about it, but I think she's really busy cuz I haven't heard back from her in months. 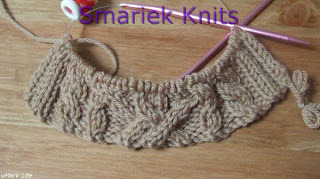 -- I've got a lacy knitting thing coming down the pike. 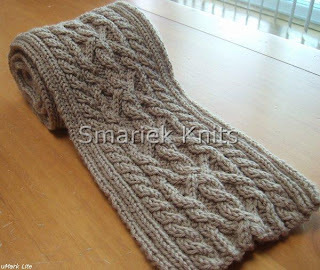 -- I'm thinking about trying KnitPicks Gloss sock yarn for a cable scarf. 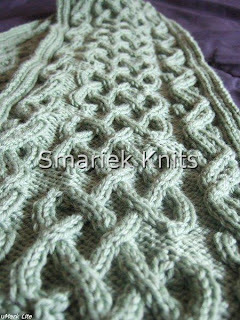 It's 70% merino wool and 30% silk, so I'm hoping it has enough "body" to hold up to cable stitches and that it will be next-to-skin soft. There aren't too many colors to choose from. I find myself gravitating towards the Cosmos dark purple color that will be available on September 5th. Not much else going on. Miscarriage #2 started last night at 7PM and went on for a few hours. It wasn't quite the same as last time and I'm worried about it being incomplete. Last time it just took a few hours on Easter night, perhaps this time it'll span a few days. I'm glad I managed to postpone my appt which was supposed to be yesterday afternoon and rescheduled it for 2 weeks later. 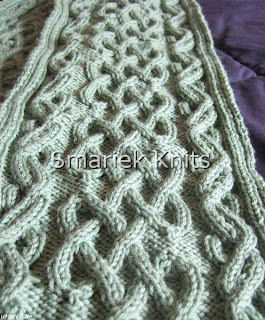 I think I'll make a little more progress on my Triumph Scarf tonight as I watch one of the movies I have waiting to be seen. My choices this time are: Shrek 2, Shrek 3, Fantastic 4 Rise of the Silver Surfer, Constant Gardener, and The Departed. 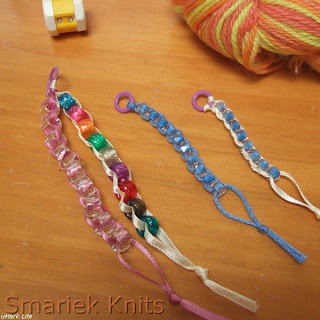 The next project has been chosen for The Fashionable Late in '08 KAL. Smoke rings! Go check it out! I've got too much on my plate to participate so I'm joining Bets on the cheerleading squad. 1. The last meal I had at a restaurant was Dol Sot Bi Bim Bap (from a Korean restaurant). It's yummy stuff! Make sure you get the "dol sot" version and not the plain Bi Bim Bap. 2. People spitting in public is something I intensely dislike. 3. The full moon beautiful. 4. San Francisco Left Turn (which is really 3 right turns) is one of my favorite local expressions. 5. Sometimes it's best to keep one's mouth shut. 6. I have absolutely no idea what is the best movie I've seen so far this year, but it might be Bourne Ultimatum which I saw in April! 7. 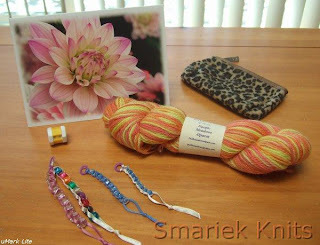 And as for the weekend, tonight I'm looking forward to relaxing with some knitting (but that didn't quite happen), tomorrow my plans include relaxing with some knitting (really gotta catch up on the Triumph Scarf!) and watching a movie and Sunday, I want to go out for dim sum!